My friends in the various book forums I frequent already know this, but I thought of sharing this for those who may need some inspiration on what to read for their next fantasy or science fiction fix. Behold! The Internet Top 100 SF/Fantasy List, as voted by the general public! That link is a Google cache link, as the original doesn’t seem to work anymore. You can also explore an extended list, and the landing page as it appeared here. It has not been updated since 2003 (2002 if you look at the extended list), and the ‘general public’ is about a few thousand users with internet access back in the day, and who bothered to take the time to type out their nominations on email, and send it out. So no, it’s not what you’d call a very broad sampling. Still, I’m immensely indebted to this ancient list primarily because it introduced Guy Gavriel Kay, George RR Martin and Lois McMaster Bujold to me, and they since became some of my most favoured writers. Beyond that, as it also introduced singular works that I’ve not heard of at that time, such as Stars My Destination by Alfred Bester, and A Canticle for Leibowitz, by Walter Miller Jr (two of the best scifi books I have ever read). When I first read it, Malaysia did not stock many of the books, what with the general supply coming from big bookstore chains that tend stick only the safe and proven sellers. Things gradually changed with the appearance of used books sales at first, with a selection of books that cannot be found in any of the normal bookstores. Fast forward to today, and you’d have trouble stemming the tide of titles flooding the market. Good thing, to a point, as now it becomes very important to separate the wheat from the chaff. But I digress. Now there are those who detest popular lists, saying that it isn’t a balanced view of what’s really good out there. It’s easy to see their point of view when you see Most Popular Titles lists dominated by the ‘it’ author of the day (read: Dan Brown). I’m not suggesting that Dan Brown is crap, but merely saying that sometimes it obscures other interesting (some say more deserving) works. I want to know what is the best or the most popular out there. I want to know what others are reading. They are two similar but incredibly distinct statements, with a very important difference. The first statement suggests that people read these lists as a barometer of what’s the best or most popular at that time. I want to know what is the best or the most popular out there. It’s a snapshot. Some of these lists simply pronounce the best of all time, and if you’re not reading any in these lists, then you’re simply not reading the best. Therein lies the rub. There are literally millions of works out there, each enjoyed by a wide cross section of the reading public. There are no lists in this world that can cover something so subjective as reading tastes in any definite way. So invariably any list will have their detractors. Those who take pride that the books they read do not appear on such lists. Those who look down on others who read authors who appear on these lists. These authors are ‘commercial’ in nature, or appealing only to the lowest common denominator. Thus their work is shallow, and the books are fit only to be used as doorstops or dead weights. Both these reactions can be true, if somewhat of a generalization. But definitely not always. When you see votes tipping the scales in thousands supporting all seven Harry Potter books, and a few hundred going for Lord of the Rings or Stars My Destination or Foundation or whatever, does that mean than the 7 of the absolute bestest books in the world are the Harry Potters? Really? I mean, even if you’re an extremely rabid a fan (and over 12 years old), surely you’d pause before trumpeting that claim in parties? At the same time, are Harry Potter books to be derided because they appear on these lists? What, now commercial success means the book must be bad? Therefore, as with any kind of generalization, there are always exceptions. Personally, though, I always look at these lists with the second statement in mind. I want to know what others are reading. I know what I love, and I love what I know. But I’m curious – what else is out there? Surely there are works that can potentially excite me, prod me, enlighten me, entertain me? So I devour lists to look for something I might enjoy – to see what others enjoy. You may find that it’s a treasure chest of inspiration, like I did with the Internet Top 100 Science Fiction and Fantast List. A spate of free ebooks being offered around the internet recently. Strange. Something I should know about? Anyway, this time it’s Tor’s turn, and you’ll be getting Sanderson and Scalzi in the first couple of weeks. Sanderson, as you may recall, was recently announced to complete the final Wheel of Time book, Memory of Light, after Jordan’s untimely passing. Tor is offering his sophomore effort, called Mistborn. If you’ve not sampled his work and curious about how he’d do with MOL, well, isn’t this just want you’d want to land on your lap? Go and signup at http://www.tor.com/. I think it’s a privilege to be able to revisit a piece of work a second time and have the opportunity to not only enjoy the work again, but to see it and appreciate it in a totally new way. Time grows ever more precious the older we get, and especially when we balance work with our personal responsibilities. So when I get sucked in a book I had already read, I know for a fact it won’t be a damned waste of my time. 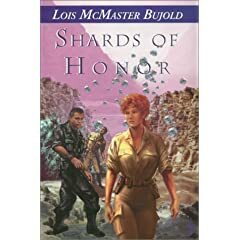 On my second rereading of this book, I can reaffirm that Lois McMaster Bujold is a true master of the craft, and Shards of Honor is a shining testament to her humanity and skill. She weaves a brilliant story with effective characterization, thoughtful pacing, intelligent dialogue, intelligent plot, well, intelligent everything. Okay, some backstory. I finished this book 3 years ago, while I was seconded in Geneva for work. I accidentally started reading it when I got back to my hotel room after dinner the first night. 2 frantic reading days later (after work hours, of course), I came up from one of the most enjoyable reads in recent memory. It’s hard to explain how I feel about this book to people who don’t normally read science fiction. Oh, I didn’t mention it? Shards of Honor is science fiction. But it’s not all hyperdrives and parsecs, and lightsabers and intergalactic alien war, with plotlines thick and dripping with genre stereotypes. Shards of Honor tells the story of Cordelia Naismith, a researcher from Beta Colony (which is analogous to a far future Earth) who got mixed up with a complex plot to dispose of a prominent military commander from Barrayar, Captain Aral Vorkosigan in a routine mission. Caught up with the events, Cordelia embarks on an adventure that turns out to not only affect them both personally, but uncover a conspiracy so fiendish and meticulously planned that fates of both their worlds hang in the balance. It’s a love story, but laced with plenty of political intrigue, and a good spread of adventure and action. See how difficult it is to explain – already the premise sounds very stereotypical of scifi. It’s not helped by my stereotypical summary. The difference is in reading it. If you’re looking for the sort of Star Wars/Star Trek like feel of space opera, look elsewhere. This is intelligent stuff. This is popcorn-like addictive, yet not popcorn-like in substance. You have to pay attention. Bujold masterfully melds intergalactic politics, with cleverly laid out characters each with their own motives, and spins them together in a stupendous plot. It helps her to have two driven, flawed but ultimately very interesting leads. A major theme in this book is an exploration of moral and honourable (or lack thereof) actions the various characters have to take in the face of the realities of war. Are responsibilities merely an excuse, or a burden? Is it acceptable to sacrifice lives for the greater good? What sort of circumstances must arise to justify such an action, and at what cost? Cordelia explores her own motivation, and sees the reasons from the host of people she encounters in her adventures. And the epilogue to Shards of Honor has to be one of the best epilogues I have ever read, period. Go and read the book to get to the epilogue, and tell me it isn’t one of the most amazing moments in reading you have ever experienced. Shards of Honor is one half of 2 books, the other being Barrayar (both books are being sold in a single volume now called Cordelia’s Honor ), and marks the beginning of Bujold’s Vorkosigan saga (oh, and Barrayar won the Nebula and Hugo, and I can tell you that it thoroughly deserved the accolades). These two books are the only ones centered around Cordelia Naismith; the subsequent novels focuses on Cordelia’s and Aral Vorkosigan’s immensely interesting son, Miles Vorkosigan. The Miles Vorkosigan series of books are no less intriguing than the Cordelia books, with a notch or two up in the adventure quotient, and seeing that Miles is not your average son with a normal childhood (I won’t spoil it for you), the Miles stories are high with witticism and humour. Bujold had written the books in such a manner where it isn’t really necessary to read them in order, but as with anything that has a chronology, it helps if you do. I personally started on Bujold with a Miles Vorkosigan book entitled The Vor Game. Cheesy title, but an awesome reading experience. So if you’ve not had the pleasure of reading Bujold yet, even if you aren’t a science fiction reader, consider this a hearty recommendation.